To examine the back of the eye, our doctors can view the retina through a dilated pupil using the microscope and specialty lenses. The dilation drops relax the focusing muscles as well as make the pupil larger for 4-6 hours. In children 12 and under, a different formula is used to determine the need for glasses, as their focusing muscles are much stronger than adults. The “kids” formula can last up to 12 hours. If you’ve forgotten sunglasses, we will give you disposable ones at the end of the exam. 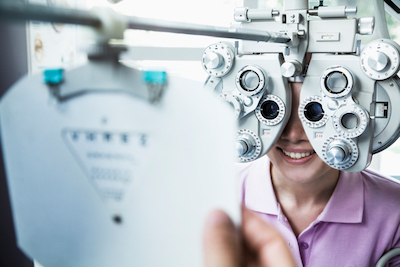 We offer screening retinal photos as an alternative to dilation for adults who do not have a history disease inside the eye, diabetes, or other symptoms supporting a dilated exam. You can read more about digital retinal images on our Advanced Technologies page.